NOTE: To learn how to use the Contour Editor tool, see About the Contour Editor Tool. Lasso Sets the selection mode to Lasso. Click and hold Alt to temporarily switch between the Marquee and Lasso modes. Marquee Sets the selection mode to Marquee. Click and hold Alt to temporarily switch between the Marquee and Lasso modes. Snaps your selection or point to any line you position it on. As soon as you move it close enough to another line, your point or selection will snap to it. Snaps the selected anchor point to any existing line while displaying temporary rulers as a guide that you can also snap your anchor point to. The Apply to Line and Colour Art option uses the concept of Line Art and Colour Art layers. Use this option to apply an action such as selecting, resizing or erasing a drawing on both Line Art and Colour Art layers, as well as the Overlay and Underlay layers. The Smooth operation lets you smooth out selected drawing strokes and remove extra points. 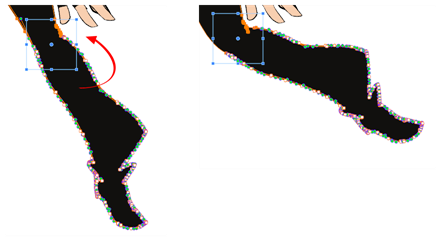 From the top menu, select Drawing> Optimize > Smooth or press Alt + Shift + S.
When drawing with the Polyline tool, your drawing has an even line thickness. 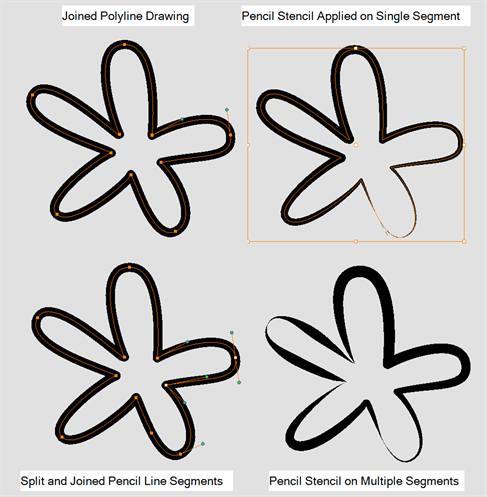 You can use the Pencil Editor to adjust the thickness point by point, but if you want to adjust it quicker, you can use the Split Pencil Line and Point Pencil Lines options to create segments and apply a pencil stencil to your drawing. Note that if you did not join the pencil lines on your polyline stroke, the segments between the points will act as separated segments.